Over the years, there are so many stories, so many times we’ve gone through difficulties and great successes. I really think that the Canadian Film Centre has grown into an essential space in the development of Canadian talent. That’s what it’s all about. That’s why you’re here tonight. L-R: Christina Jennings, CFC Board Chair, Chairman and CEO, Shaftesbury; Slawko Klymkiw, CEO, CFC; Norman Jewison, CFC Founder and Chair Emeritus; and Lynne St. David-Jewison, with the CFC's 30th anniversary cake. Photo by Tom Sandler. Neither humidity, rainclouds nor showers could dampen the spirits of our intrepid guests at the 2018 CFC Annual Garden Party on Wednesday, June 27. Many of them come from the entertainment business, so they know the show must go on. And so it did, complete with fine food, drink, entertainment and by evening’s end, a beautiful pale pink sunset. This year’s Garden Party also marked the 30 th anniversary of the founding of the Canadian Film Centre (CFC). In 1988, the vision of our celebrated CFC Founder and Chair Emeritus, Norman Jewison, drew together the first members of the CFC Circle of Supporters. 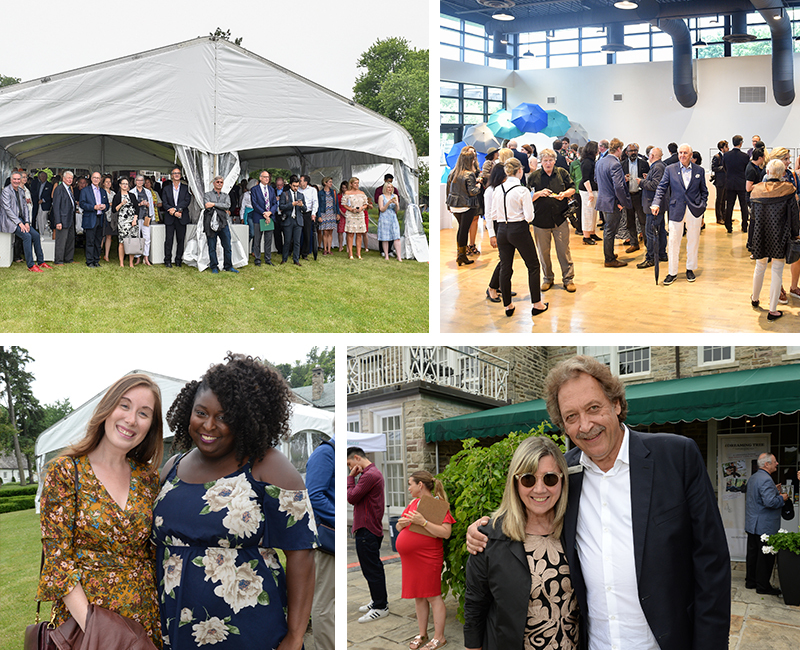 This group of philanthropic individual donors – and guests of honour at our annual Garden Party – generate contributions to the CFC that have continued to make our work possible and keep us at the vanguard of new industry developments. Since that auspicious beginning, and across three decades of substantial industry-wide transformation and flux, the CFC has continued to grow, adapt and lead. It has nurtured new content, careers and companies of Canadian creative and entrepreneurial talent in the screen-based and digital industries – a remarkable journey worth celebrating last night. Photos by Ernesto Di Stefano/George Pimentel Photography. Guests arrived early and, from the shelter of tents, admired the grounds of Windfields Estate rich in bloom. They received a handy, if not entirely glamorous gift upon entry: a rain poncho, which some took playful advantage of. Our two signature cinematic cocktails, the “Green Screen” and “Red Carpet,” were as refreshing as they were beautiful in hand. So was the parade of gastronomic delights our food and beverage partners specially created for the event. In addition to Norman Jewison and Lynne St. David-Jewison, some of this year’s special attendees included: Paul Bronfman, Chairman/CEO of Comweb Corp. and William F. White International Inc. and Chairman of Pinewood Toronto Studios Inc.; Peter Apostolopoulos, President, TriBro Studios; Rochelle Adonis, Judge, The Great Canadian Baking Show; journalist and documentary producer, Ann Medina, one of our first producer residents from 1988; Peter O’Brian, Chair of the Board of Directors, TVO (and the first executive director of the CFC); and Rob Oliphant, M.P., Don Valley West. Top L-R: Guests under the tent and inside the Northern Dancer Pavilion (Photos by Tom Sandler); Stephanie Coffey and Christine Armstrong, CFC alumna (Photo by Tom Sandler); Christina Jennings and Slawko Klymkiw (Photo by Ernesto Di Stefano/George Pimentel Photography). Early in the evening, our emcee, Christina Jennings, CFC Board Chair, Chairman and CEO, Shaftesbury, welcomed everyone. She acknowledged our loyal CFC Circle of Supporters, some of whom present that night had been involved in the CFC since its inception. She thanked the event’s partners, sponsors, donors and volunteers for their support and then introduced Slawko Klymkiw, CEO, CFC. Klymkiw recognized some of the instrumental figures from CFC’s past, especially the board members and former executive directors of the CFC. These luminaries, he noted, have “led the organization in the right direction,” and helped build a strong network of generous donors, supporters and industry partners. Klymkiw also paid tribute to the man of the hour, Norman Jewison, for having the foresight 30 years ago to say, “’We need a place that incites Canadian talent, gives them an opportunity to grow, and gives them a chance to do great cultural and entertainment work.’” Thirty years ago, that vision led to the start of the CFC. Klymkiw then turned to Jewison and said, “On behalf of all of the board members and people who have worked here, it has been a privilege to be a part of your vision. And that vision continues to grow." Then, Norman Jewison himself rose to offer his personal reflections on the CFC’s start, emphasizing how he is “so proud of this place” (as are we!). Jewison narrated a brief story of his conversation with Charles Taylor, the son of E.P. Taylor, who owned the original Windfields Estate. More than 30 years ago, Jewison flew Charles Taylor to California to see the American Film Institute, then at a mansion in Beverly Hills. There, he turned to Taylor and said, “We can do the same thing in Canada. We can have a national film centre, a place where Canadian talent will grow, will be nurtured, where they will have their own place in the world. I said to him, ‘It’s very important, Charles, that we grab a piece of the action on the screens of the world. And Charles really came through.’"
No anniversary celebration would be complete without a cake, and at the end of Jewison’s remarks, we received a gorgeous one lined with vintage pics from the Centre’s history. We didn’t even need to wait for anyone to cut us a slice, as trays of equally beautiful cupcakes soon emerged from the wings. L-R: Bill King and Kim Stockwood; Neil Haverty. Photos by Ernesto Di Stefano/George Pimentel Photography. Following the speeches, guests enjoyed two sets of musical performances. First, Slaight Music singer/songwriter Kim Stockwood, accompanied by Bill King, sang for us, and second, Neil Haverty, an alumnus of The Slaight Family Music Residency, and his band, Understudy, composed of Leon Taheny, Kenta Aoki and Zach Bines, picked up the pace by rocking out. These two groups treated us to two songs each, and since the rain had cleared by then, there was even a bit of dancing on the lawn. The CFC extends our appreciation to The Slaight Family Foundation, both for these fine performers and for their support of the CFC Slaight Family Music Lab – which just graduated its latest alumni earlier this week at our Music Showcase. Inside the Garden Party was the CFC Innovation Zone, where four of CFC Media Lab’s IDEABOOST-Network Connect companies took part: Albedo Informatics’s LARGE; Geogram’s “An Experience by Geogram”; House of VR’s “Prosthetic Reality”; and Impossible Things’ ReBlink, an excerpt reprised from its earlier show at the Art Gallery of Ontario (AGO). One of the guests enjoying the augmented reality experience, ReBlink, by Impossible Things in the CFC Innovation Zone. Photo by Tom Sandler. 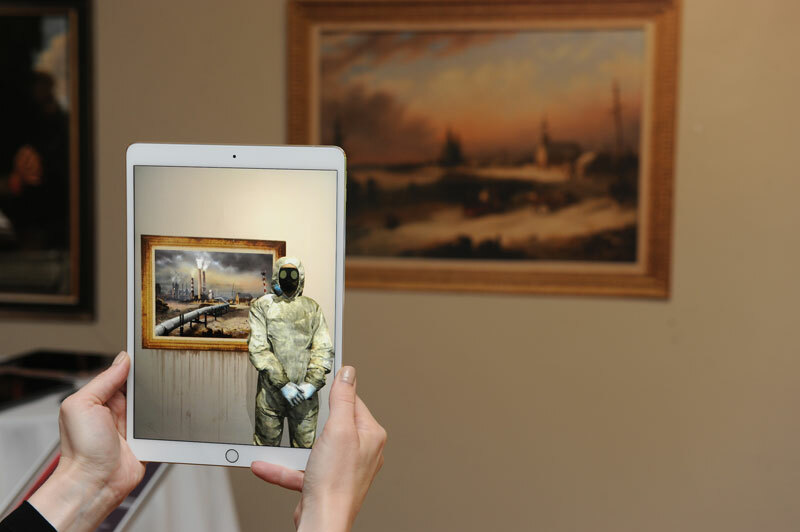 Guests also marveled at Small Wonders: The VR Experience, a groundbreaking VR collaboration of CFC Media Lab, Seneca’s School of Creative Arts and Animation and the AGO. This VR experience depicts a complex scene of heaven and hell that was originally represented in a 500-year-old European prayer bead, a bead small enough to fit in the palm of one’s hand. The VR experience, produced by micro-computed topography (micro-CT) scans, allowed viewers to explore the intricate carvings of this tiny prayer bead from various angles and in detail otherwise inaccessible to the human eye. This year, four lucky recipients took home these generously-donated and enviable experience packages: “Beauty, Fresh Off the Vine,” from Caudalíe; “Essential Relaxation,” from Woodlot; “Happy, Healthy, Hydrated,” from Flow Water; and our own contribution, “The CFC Silver Screen Experience." As last night proved, our esteemed guests would never let poor weather stand in their way of a fun party. They also would not miss the opportunity to join us in honouring the CFC’s last 30 years. On this momentous occasion, we look forward to the next generation of talent to come from the CFC and make it shine even more brightly in the years to come. No matter the challenges and changes our entertainment landscape will no doubt face, the CFC is more than ready to respond, reframe and lead into the next 30 years and beyond. A warm thank you to everyone who braved the elements to attend, and to everyone who supports the CFC Annual Garden Party and the CFC year-round. Enjoy a selection of photos from the party here. Join the CFC Circle of Supporters today! Get sneak peeks at the best films before they hit theatres. And take pride in knowing you’re advancing the groundbreaking work of the CFC and building on Norman Jewison’s legacy for the future – another 30 years and more! Happy Anniversary, CFC. Photo by Tom Sandler.